Thank you for the invitation to your inauguration. No doubt it will be the event of the year, a historic event that the world will be watching. Unfortunately, we cannot attend. We send our sincere regrets. We'll be watching from afar – Austin, Texas, to be exact. One of the reasons we cannot attend in person is that I'm now 30 weeks pregnant, preparing for our first baby. He will be born within the first few months of your administration. My husband and I are hopeful for his future, and we believe that active, involved and informed parents can raise a smart, engaged and informed future leader. Under your leadership, and in partnership with the many leaders in our country, we hope that we can stabilize our economy, make real progress to provide health care for all Americans, improve the education system (especially in the State of Texas), improve our relationships with countries around the world, choose our battles more carefully, literally, and make the environment a top priority, to name a few of our many hopes for the next four years, and beyond. Have a great day, Mr. President. It will be a great day for all of us. Yes. I know the holidays are over. Our Christmas stuff is (finally) back in the attic and Jer is safe now that all the cheesy Christmas music has stopped. But even so, I just can’t seem to let go of my favorite part of Christmastime: the photo holiday cards and letters... They are still all laying out on our counter and I LOVE looking at them all! So to help me through this, I thought I’d share JUST A FEW of our favorites… and then I can pack them away and finally have my kitchen counter back. These boys are growing up WAY TOO FAST! WOW! He looks just like his Daddy! We want to go on vacation with them! Our friends Gretel & Miguel had a busy and exciting year! Our friends Nate and Vicky are expecting TWINS this Spring! And finally, many of our friends send cards with photos of their dogs. Our good friends and old roommates sent a great card starring their dog, Jasmine. At our 28 week appointment on Friday we learned that Baby Remington is 3 pounds, 3 ounces. 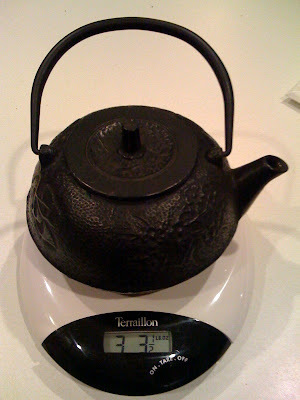 And keeping with the tradition, here’s something special from our home that is exactly the same weight: a teapot I bought with my best friend Liz (Booty) on my first trip to Paris. I just watched the performance of Austin’s own Okkervil River on The Late Show with David Letterman. Before the band took the stage, Dave and Paul Shaffer chatted it up about how much they love Austin, or particularly, how much they love the BBQ and Tex-Mex. Dave even gave a shout out to The Salt Lick in hopes that they would send him some grub (his words). It’s interesting seeing localish bands that you’ve seen so many times here in town start to break out. Seeing Okkervil on Letterman reminded me of when Bob Schneider got the chance to play Leno. Yeah, it was essentially because then-girlfriend Sandra Bullock put some of his songs on the soundtrack to the crappy movie she was promoting at the time, but it was still pretty cool to see a local scratching the surface of the big time. After appearing on stage in Houston with my all-time musical man-crush last year, Alejandro seems to be breaking out more than ever. Of course, when our local favorites don’t seem to sustain on the outside, that means we get to see them more often here in Austin and keep them more to ourselves. It is interesting how some artists can be so hugely successful in a city/region/state but not seem to break through on a wider scale. I was recently reminded of my hometown’s own local-only hero, Michael Stanley, when my brother-in-law surprised my sister with tickets to see Michael Stanley just after Christmas. Has anyone outside of Ohio ever even heard of Michael Stanley?